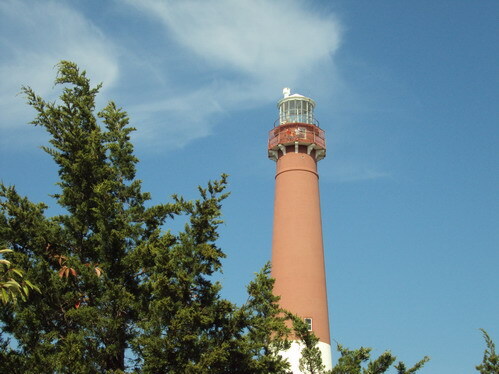 Esther and I decided since we would not be able to do any of the NJ Lighthouse Manager's 2010 Lighthouse Challenge this coming weekend that we would at least get to one lighthouse on our "fake" wedding anniversary. (We were married on October 12th 1974 which was no longer officially Columbus Day but we still think of it as the real columbus Day). Esther and I spent our honeymoon on Cape Cod staying at a motel in Buzzard's Bay, MA and visiting places like Provincetown, Martha's Vineyard and Chappiquidick (we managed to not go off the bridge there). 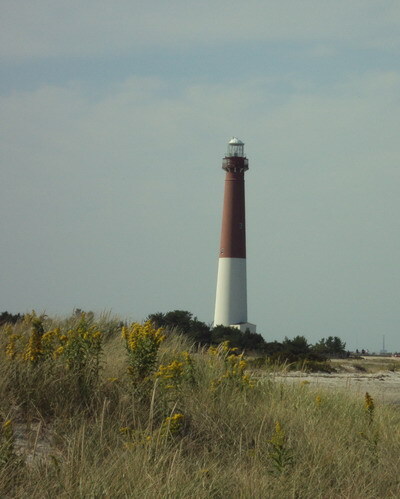 We actually spent sometime at a number of lighthouses but didn't catch the lighthousing bug for many years- it took real hold in 1999. 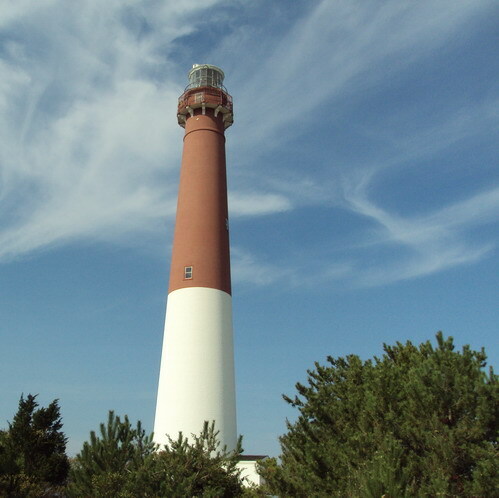 Monday Esther was off and the weather was just beautiful so we decided to take a ride down the Shore and when Esther asked which lighthouse should we visit I said Barnegat for no particular reason. 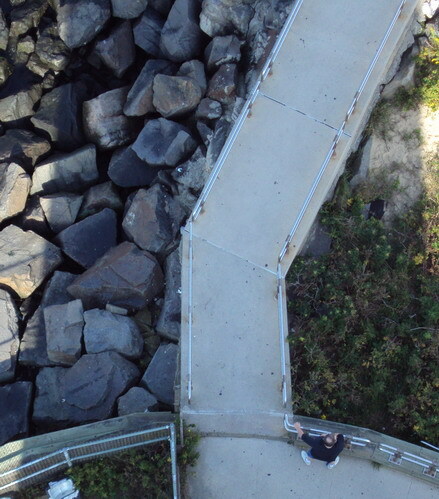 Esther brought along her camera and took these photos on the ground and at the top of the lighthouse. I opted to not climb due to my knee problems with that many steps. 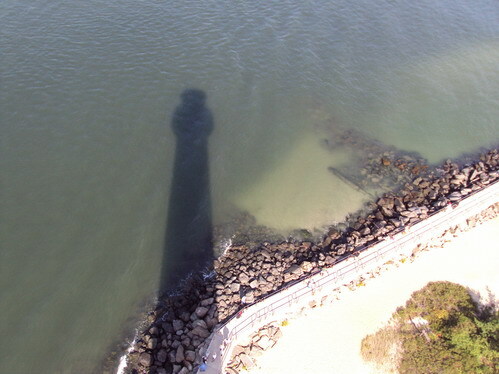 This one shows the shadow of the lighthouse. This one shows the back of my head - which is getting easier to see every day. 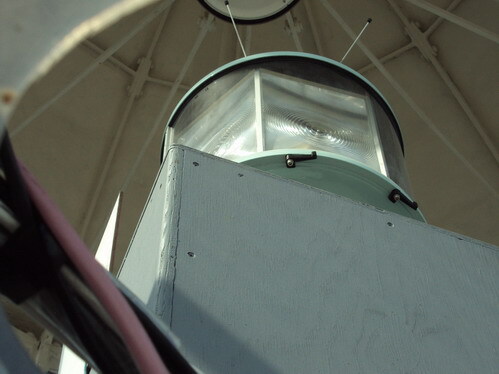 Here's a photo of the present day optical that is used in the lighthouse. 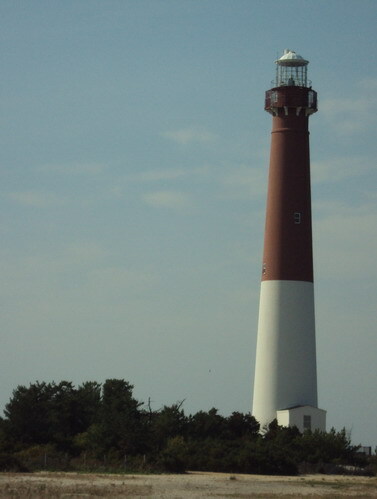 It was officially relit on January 1st 2009 which was 150 years from the date it was first lit. Esther continued walking out on the breakwater while I talked football with an Eagles fan and a Cowboys fan - and they were actually friendly with each other. 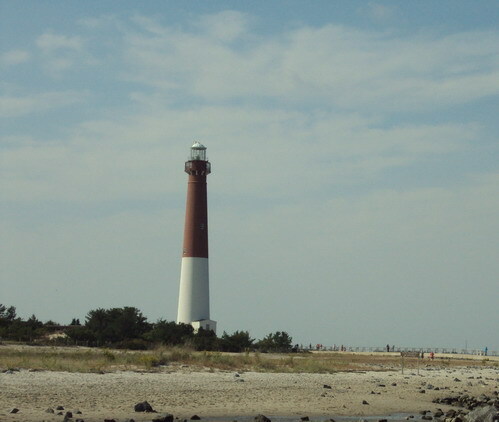 We left the lighthouse and rode around LBI for a bit and had a nice lunch at one of the few restaurants still open. It was the last day it would be open, though. It was a fun day and while it's not quite the whole Challenge it was a good enough substitute for us. Wonderful post. Thanks for sharing. We visited Barngat summer 2009 and really enjoyed it. Really liked those first two Pics there....Picked a good day to go. Also started our LH bug in 1999 ourselves....The years seem to really fly by now.